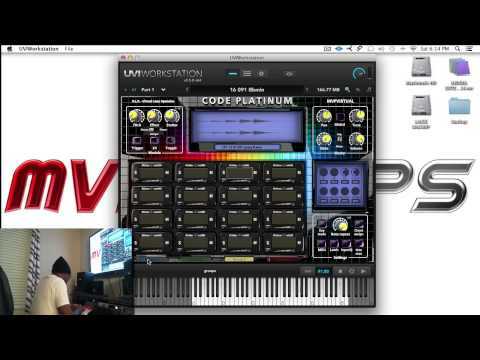 Code Platinum has arrived, the new triple-threat virtual instrument from MVPVIRTUAL a division of MVP Loops. The entire MVPVIRTUAL series is spectacular, but Code Platinum is truly special featuring following the VLX 2.0 design that features a 4 bank 64 pad MPC style interface ready to be a go-to instrument in your sound arsenal. Code Platinum has a platinum host of multi-samples, loops, riffs, and one shots! Code Platinum contains 125 multi-sample instruments specifically designed for modern beat making. You also get onboard effects including reverb, delay, compression, eq, adsr, modern stutter andy pitch, HP/LP filters, chorus, flanger, and phaser. STYLISTIC - Code Platinum consists of sounds perfect for developing any modern genre of music, but it really focuses on urban styles including Urban Pop, Trap, New RnB, Pop, and we've also included some soulful R&B styles that can be flipped in some many different ways it will amaze you. ENDLESS POSSIBILITIES - We know that people produce music in different ways and Code Platinum allows you to create music how you choose to. You may like to start with some of our incredible sounding drums and bang out a beat foundation, or you may want to call up a loop and build on it, or do you prefer to use the riffs and samples to create something unique, or lastly you might want to tap into the custom designed multi sampled instruments and lay something down that way. It doesn't matter, do what you do, Code Platinum is flexible! Freedom is a wonderful thing! WHAT'S GOOD - First and foremost we believe in starting with incredible sounds period. With nearly 2 decades of sound design experience and a team responsible for millions of records sold worldwide you've heard our sounds on countless hit records, tv, and films....true story! The sounds for Code Platinum were developed and hand picked to give you "that sound"! We used a combination of hardware and software to developed and meticulously tweak all of the sounds in Code Platinum including SSL, Toneluxe, Apogee converters, Antelope Isochrome clocking, and more so your sounds will cut through the mix without having to do tons of stacking. YOU STUTTERING & REPEATING YOURSELF - The Stutter is a staple in today's music production, and Code Platinum has a stutter feature you will fall in love with using. Simple, but powerful, use this like an gated arp to create detailed melodies. Then let's get to the note repeat, gotta have it right? You wanna create intricate drum patters for trap or EDM, no problems, our note repeat goes all the way up to 128th triplets! What's most important is that these features are easy to use whether you are in the studio, or performing live. DESIGN - If you are a guy that loves tweaking sounds pull up Code Platinum's ADSR and tweak to your heart is content, don't forget about those crazy good effects onboard. Get your sound just right. INDEPENDENCE - All of the fx can be individually assigned to pads so that means you can choose different fx for different sounds. Put a reverb on that clap, a note repeat on that hi hat, a compressor on that 808, and a filter on that pad loop.....you get it right? Oh yeah, I almost forgot....we have mute, solo, volume, and pan on each pad! SITTING IN DA STUDIO & ON YOUR GIG - The beauty of Code Platinum and all our instruments is that we make them for the studio and the stage. Let's say you are a DJ and you want to use Code Platinum on your gig. It has features like latch and input quantize that make performing easy! If your sitting in the studio and need to bang out a hot beat quickly, no worries Code Platinum is easy to use, and efficient, because we all know time is money! Crank out more music than your completion, and sell more beats and get more placements. STRETCH BEFORE - Why is it that today's top beat making hardware machines don't have time stretching? That's not cool. What is cool is the time stretching on Code Platinum! Make drastic time changes on loops and riffs without changing the pitch or getting those nasty artifacts. SWITCHING UP - Create custom kits, and make sure you get the right sound with Code Platinum's sample exchange feature. It's quick and easy, put any sound in the database on any pad. BEAST MODES - Key Mode and Chord Assign are hotter than the baddest chick from high school! No joke, with key mode you can pick and sample, loop, or one shot and instantly spread it across the keyboard instantly making it a playable instrument. Can't play keys but know the chords you want? No problem, use the chord assign feature to set up all of your chord progressions on pads. Now that's hot for both the studio and stage. CLOSE THE CLUB - Code Platinum is one incredible sounding virtual instrument that is easy, powerful, and modern. It's made for the modern beat maker, don't delay download it today!